Speak to Manni the Reveller in Rellekka. * Indicates an item that is obtained during this quest. 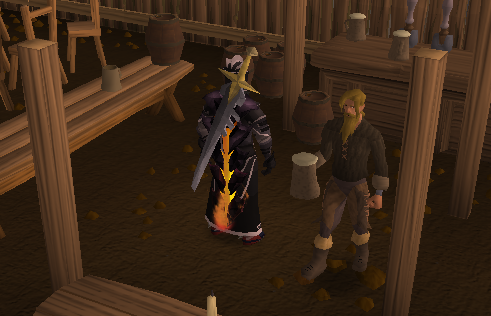 To start, speak to Manni the Reveller, an ale-loving member of the Fremennik council. 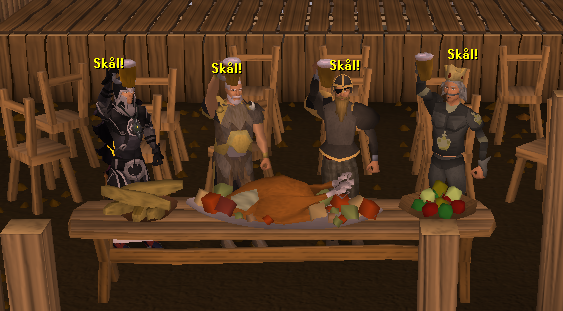 He will give you a glass of beer (not needed for quest) and will ask you to invite Mawnis Burrowgar from Neitiznot and King Vargas from Miscellania for Chieftain Brundt's birthday feast. Talk to either of them. It does not matter to whom you speak since both will decline to visit as it is 'a world of trouble'. You then should go and talk to Manni to find the reasons for this. Speaking to Manni will result in a conversation with Brundt, which in turn will reveal why both Vargas and Mawnis are angry with him. At the same time you will find there is no love lost from Brundt's side for them. There is a cutscene as Brundt recollects his memories. You find out Vargas, Mawnis, Nial Swiftfling, Asleif (the woman who was killed by the man in a bear suit from Mountain Daughter) and Brundt, went off adventuring but were defeated and ended up outside the Fishing Guild. Brundt and Mawnis argue with each other about the location of the tablet. Brundt suspects Mawnis of thievery and the scene ends. Brundt wants you to find out who stole the prophecy tablet. He will give you some incomplete directions to an ice cave: 'Search the coast for unusual signs'. Go talk to King Vargas who gives his memory of the story. The four adventurers will find a monster. Whilst fighting it with his dragon long sword, Prince Vargas will be hit with some sort of magic or poison. The cursed Prince Vargas has no recollection of Nial Swiftfling fighting the monster, due to him 'going off and killing himself somewhere'; at the same time he thinks Asleif did not help anyone. After telling you his story he will add to the directions: 'From Rellekka, head east'. He also asks you to find a way to rid him of his yeti curse. Go talk to Mawnis Burrowgar who gives his memory of the story. The Gnoeal fires a green magic/goo attack at Nial. Aslief inquires if anyone is hurt and Mawnis says Vargas got a bit of it on him. Nial then turns into a yeti and attacks the Gnoeal. He kills it, but then attacks the party as he has gone out of his mind, and they flee. He will give you some directions, 'At the foot of the mountains, turn north across the ice'. 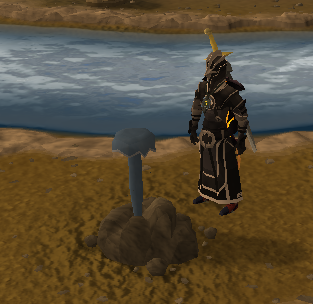 Remember to bring a pickaxe. 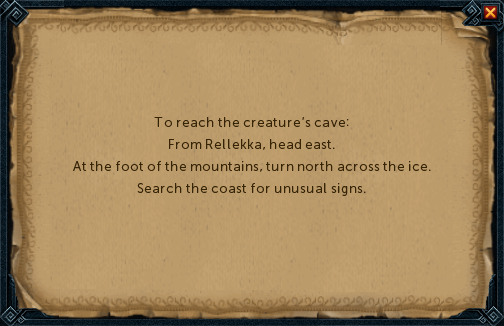 Follow the directions you have to have a completed cave directions sheet to be able to find the cave. You will reach the polar hunting area. Keep heading north, ascend the stairs, and go to the northwest corner where you will see footprints. 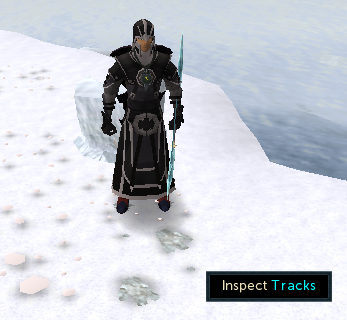 Right-click the footprints and inspect them to get a message saying they are from a large ape-like creature. Follow the footprints until you reach the large ice block; inspect them again to get a message saying they seem to end at the ice block. 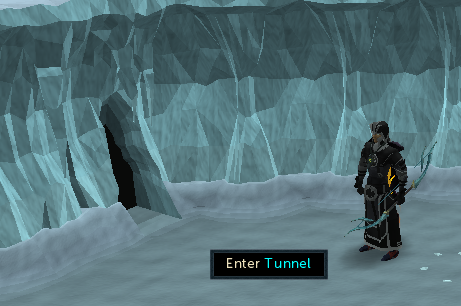 Right-click on the ice block and choose "dig" to open the cave. 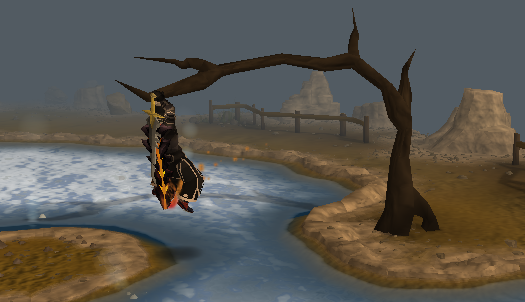 Make sure you are ready to fight the level 81 Nial Swiftfling. 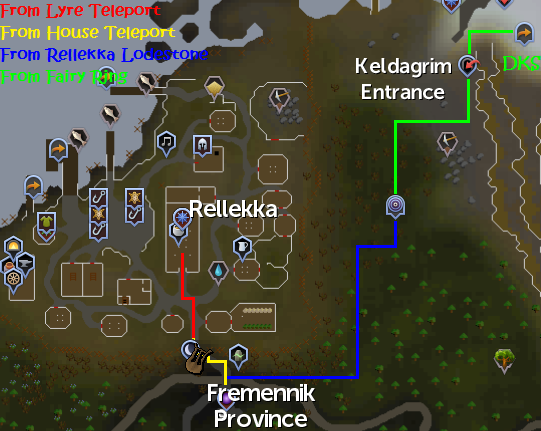 Turn on run, head directly to the south west corner, and go through the passageway. You will be running through a multi combat zone filled with aggressive Yetis and Gnoeals. Yetis attack with melee, and Gnoeals with range, so remember to bring enough food. When running through the outer room, using either Protect From Range or Protect From Melee is useful to minimize damage. You will run into the level 81 Nial Swiftfling, as a Yeti. 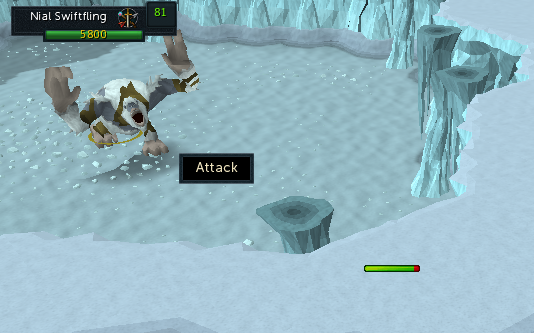 He uses ranged attacks if you are not in close proximity to him but will attack with melee when you melee him. If you attack melee style he will knock you back and deal some damage to you. With Range/Mage from a distance this won't happen. Tip: There's a safespot near the entrance to this room. If you use your Protect From Missiles prayer and mage or range Nial, you will minimize the amount of damage taken. 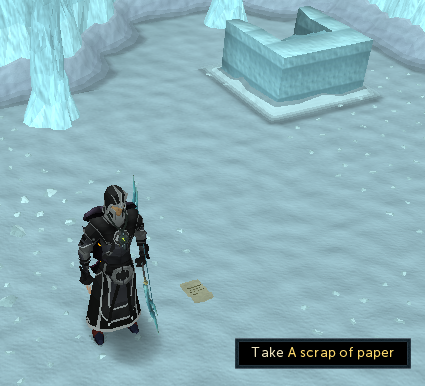 Near the entrance of the ice cave there is a scrap of paper which appears to be from an adventurer going through the yeti curse. Go to the Mountain Camp. 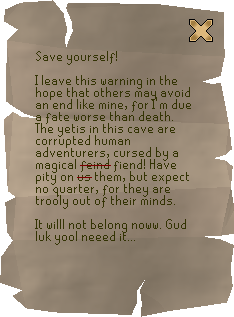 You need to take Aslief's Herb Pouch and the Yeti hair, an empty vial, a pestle and mortar, 10 earth runes and 1 cosmic rune, and 1 clean irit. Take a pole and plank from the goat pen. 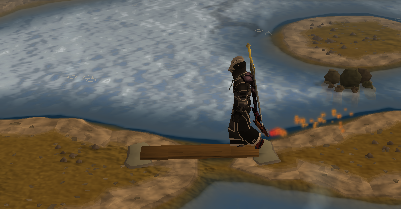 Use your pole with the Clump of Rocks in the water to jump across, and then use the plank with the Flat Stone to walk across onto the island in the center of the lake. Talk to Asleif by listening to the shining water. She tells you to make the yeti cure potion using her Diamond root and to take it to King Vargas. Get the empty vial and use it on the spring. Use the clean irit on the vial. Use the pestle and mortar on the Diamond Root to create Diamond Dust Root then enchant the Diamond Root by using enchant level 4 spell, use the Enchanted Diamond Root on the potion. Finally use the Yeti Hair on the potion to make a yeti curse cure. Take the potion to King Vargas and, after drinking it, he will become human again, and agree to go to the feast. Go to Brundt and talk to him about the rune. He remembers the Mysterious Mage (Baba Yaga) being with them. He will agree to go to the feast. Head over to Jatizso and speak with Freygerd, Nial's fiancé. You can find her wandering east of the anvil and weapons shop. Tell her you have put Nial to rest and she will be relieved, but has a problem that she wants to move back to Neitiznot but cannot due to King Gjuki Sorvott IV imposing a hefty emigration tax. Talk to the king and plead with him to remove the tax. Give Freygerd Nial's throwing axe. She will then tell you to talk to Mawnis. Talk to Mawnis Burrowgar and after finding out Freygerd is coming back he will agree to go to the feast. Talk with Manni and enjoy the feast! Go to Baba Yaga in her chicken house on Lunar Isle, and have the Unfinished Astral Rune in your inventory. Talk to her, and she will tell you her side of the story. Then ask her about astral runes. Once you return her lucky Astral Rune, she will give you an Experience lamp which gives 2,500 XP to the skill of your choice. She will also give you the prophecy tablet from the storyline. 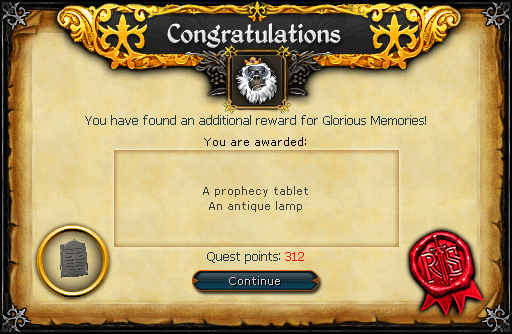 Take the tablet to Historian Minas in Varrock museum for 10 kudos. 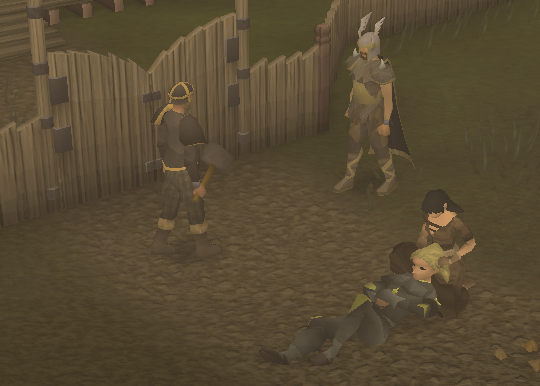 [^] Talk to Manni the Reveller in the Fremennik long hall. 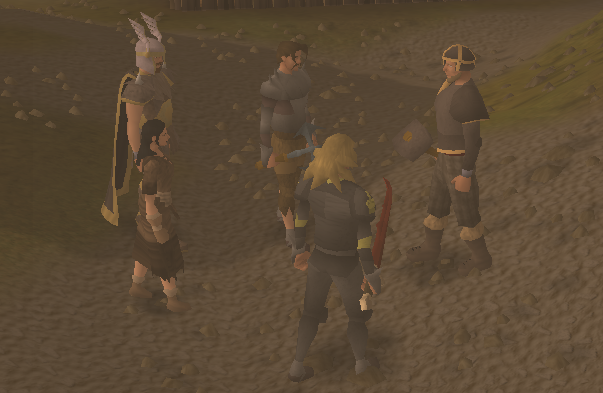 [^] Talk to King Vargas in Miscellania OR Mawnis Burrowgar in Neitiznot. [^] Talk to Manni, then Brundt. [^] Talk to King Vargas. [^] Talk to Mawnis Burrowgar. 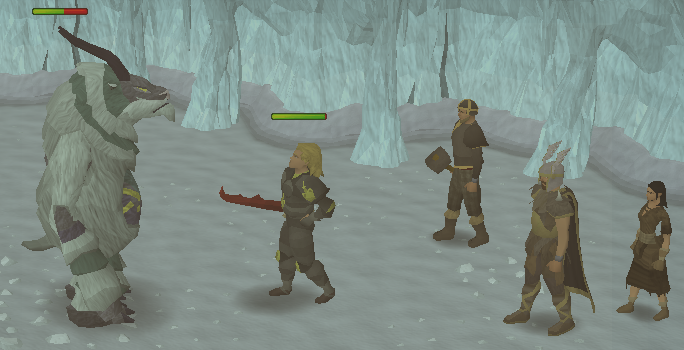 [^] Bring a pickaxe, go north of the polar hunter area, inspect the footprints and dig open the cave. [^] Run to the south west. 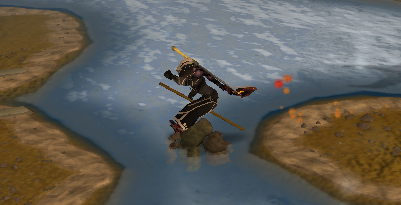 [^] Kill level 81 Nial Swiftfling, pick up all his drops. [^] Go to the mountain camp, with Aslief's Herb Pouch and the Yeti hair, a plank, an empty vial, a pestle and mortar, 10 earth runes and 1 cosmic rune, and 1 clean irit, take a pole from the goat pen and go to the center of the lake. [^] Talk to Aslief by listening to the shining water. [^] Grind the diamond root and enchant, then combine the ingredients to create the yeti cure potion. [^] Talk to King Vargas and make him human, he will agree to go to the feast. [^] Talk to Brundt, and he will agree to go to the feast. 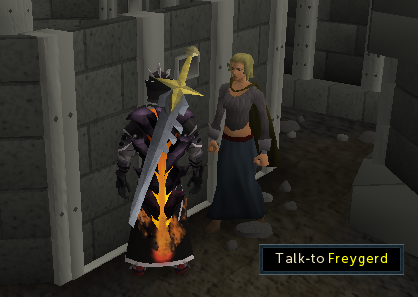 [^] Go to Jatizso and talk to Freygerd. 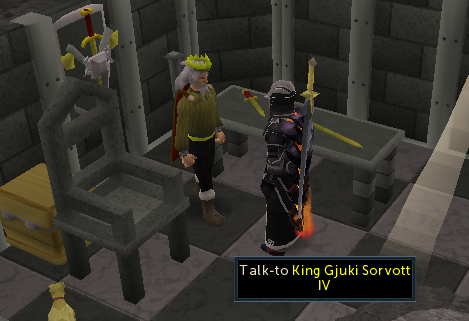 [^] Talk to King Gjuki Sorvott IV, and persuade him to remove the emigration tax. [^] Give Freygerd Nial's axe. [^] Talk to Mawnis Burrowgar and he will agree to go to the feast.